Pictures & descriptions with thanks to students of Shihan Patrick’s dojos.Upon entering a dojo (training ground) for the first time, you would notice that students are denoted by the different belt colours they wear. The belt colours not only symbolises seniority, but also serves as inspiration and guidance for each student of Kyokushin Karate at different levels; both in techniques as well as the attitude in daily life. In the journey of grading, the belt colour changes from that of junior’s to senior’s. Being new, unaware of the requirements of Kyokushin Karate and lacking in experience of it, the white belt’s heart is said to be full of hope. From this hope sprouts the first enthusiasm to train and learn. 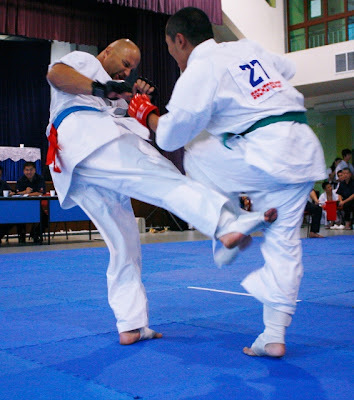 A student of Shihan Patrick, who started off as a white belt. he is currently grading for the yellow belt level after passing the orange and blue belt levels. Apart from black belt, white belt is most important of all in the life of a karate student. There will be new techniques to be acquired, new rules and requirements of the dojo, and new demands on the body and mind. With perseverance and dedication through this stage, your whole life can be changed forever. The distance you can go is up to you and only you. There should be sheer determination to never give up, and have no rush. Work steadily on your fitness. An unspoken rule of the dojo is that one is only recognised for one’s willingness to make the effort. There is no shame in being a white belt. Wear it with pride. Remember, even your instructor was a white belt once. Progressing from white belt comes the orange belt. The first colour after purity level which is associated to earth (soil) colour. The major focus at this level is understanding the physical base. Power and progress are built upon a solid foundation. Fundamentals such as your stances (eg. sanchin dachi) are very much reinforced and expected to be perfected. At this stage, a lifestyle and vision of ambition, gratitude, persistence and vitality should be adopted. Every student must establish a commitment to attending classes. There can be an internal battle for each individual in overcoming self-defeating stubbornness that resists the desire to attend lessons. It is your battle to win. Orange belts should be enthusiastic in training, treasures dreams of greater things to come. Blue, the symbolism for colour of water. Blue belt at this level develops a basic ability to adapt and react fluidity. Just as water adapts to the shape of whichever object is holding it. 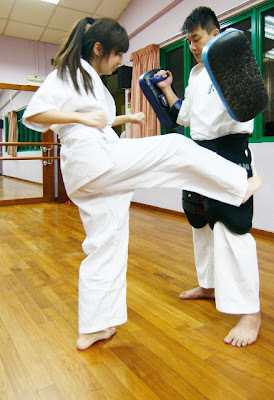 Adaptability grows through kumite (sparring). Independence begins to establish itself, the student learns to adapt karate to best suit his physical strengths and weaknesses. Development for a strong body, especially in the torso and arms takes place. Special attention is paid to training push-ups using the forefists and finger tips. In terms of flexibility (physical and mental), students at this level should do relatively well in stretching (which can be achieved through regular stretching). Enthusiasm wanes sometimes to the point of despair, with desire to give up. Remember these are part and parcel of training; being able to recognise stumbling blocks in your journey of learning and appropriately dealing with them successfully is essential. Stay calm in the midst of a raging battle (be it during kumite or your internal battle), the spirit and mind of a true Kyokushin Karate student shall remain unshaken. 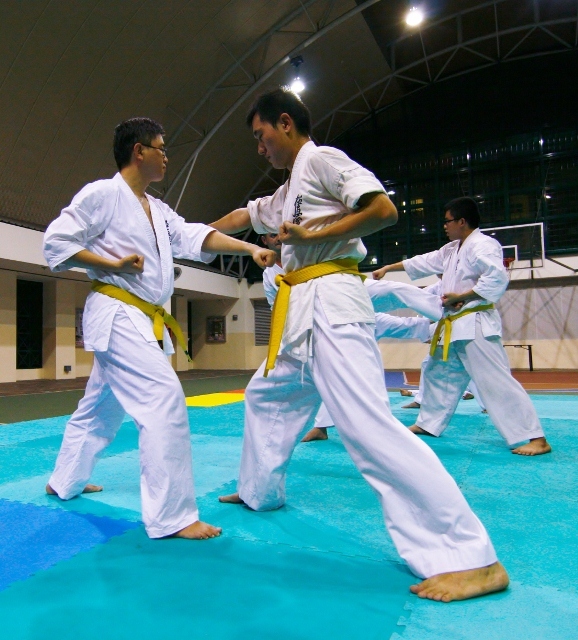 Apart from concentrating purely on physical skills (such as balance, stability, eye/hand co-ordination, and general technical ability) as compared to previous belts, Yellow belt also requires serious consideration to the psychological aspects of training- perception, awareness, assertion, and other manifestation of will-power. Students are expected to apply his/her intellect and awareness in co-ordinating the basic physical concepts of karate with his/her own mind’s immense potential. Be confident in your growing abilities and be decisive in your every actions. Do your best to refine your karate knowledge and learn to perform all the movements in a pure and correct way. Fears are overcome by confronting them confidently. Never be tempted to rush through the grades. Every individual should realise that the most difficult enemies to overcome are selfishness and egotism. Any goals you set to train towards are standards of comparison within yourself, not with others. Learn to train humbly, but with indefatigable determination. Posted on January 26, 2012 by admin. This entry was posted in belt colour meaning. Bookmark the permalink.